Paper Dungeons is a top-down roguelite in a very similar vein of Desktop Dungeons, with a few interesting ideas on survival and resource management. 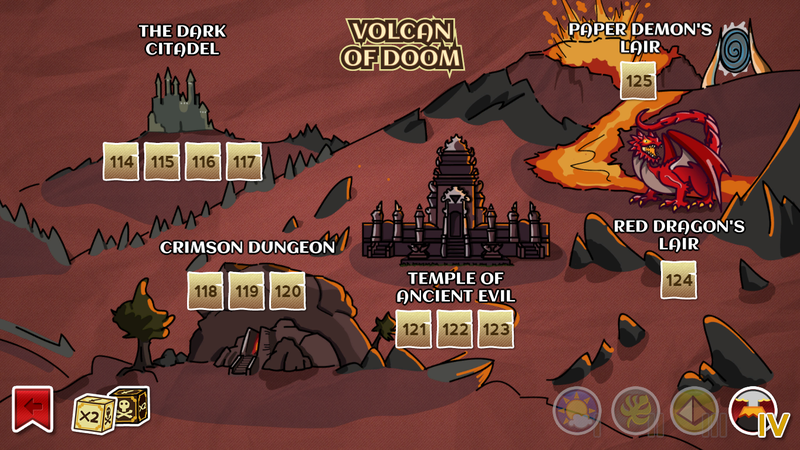 Paper Dungeons, at it’s heart, is a board-game styled roguelite about a typical adventure going around randomly generated dungeons and killing stuff in order to face the boss. Pretty standard fare, but it does use it’s roguelite elements to fairly good use, if a bit limited in scope. Being a top-down turn-based roguelite, combat is the main focus of the game, with two “interesting” aspects thrown in. In general, it plays like an extremely simple roguelite, You move around, fighting monsters, levelling up, and gaining stat bonuses. The Regeneration system is the easiest to explain: you only gain health for uncovering new tiles, instead of simply waiting. This means, at any one time, you have a limited “pool” of health to regain. This, combined with the limited number of monsters, gives the game a more of a puzzle feel. Exploration can lead to treasure, but you have to be careful that you don’t overextend and waste that health you could have. The Combat system is an extreme simplification of most other roguelikes. Your only stats are health, attack, defence and mana, no prizes to guess what these do. Anyways, you roll two sets of dice, a “combat” die and an “effect” die. The combat die will modify your direct damage, either increasing it by up to 50% or decreasing it by up to 80%. The effect die can do nearly anything, from increasing/decreasing damage, providing modifiers against certain types of enemy, to giving you gold. Combat is also “sticky” as you can’t disengage with an enemy until one of you is dead. Each class comes with an escape ability that can be used to disengage, but those take a long time to recharge. You can use healing items, like potions and food, but they are often heavily reduced when in combat. Adventure and Rogue are fairly similar in execution, with Adventure having a more pre-planned feeling to the dungeons. Puzzle, as it implies, is a less random mode and shows off a bit more of the intricacies of the game. Instead of the dungeon and combat being random, the game removes all that stuff and allows you to focus on fiendishly difficult dungeons. Combat is handled by just comparing attack and defence, and you can see the entire dungeon. Don’t worry, you still get the “discovery” regeneration. It’s actually really interesting to see how a small choice at the start of a puzzle dungeon can make or break your chances for success. Often, they are engineered in such a way that you will end with 1 HP remaining, or have to make a supposedly bad choice at the start. The graphics are a bit bland, if I am to be honest. But, for a cheesy roguelite, it’s fine as it is. Sometimes, after exiting the options menu or selecting “restart” after dying, the game keeps the dark shading. When you restart a level, something… weird sometimes happens. The shading stays dark, your character appears on fire and doesn’t appear to move, but really can move, and will die on any sort of damage. It’s…. odd to say the least. Overall, I really enjoyed the puzzle game portion. Like, I really, really, really enjoyed it. I enjoyed it enough to say that it should be the leading feature, with everything else being a bonus. The Adventure and Rogue game modes can be a bit tedious, especially since all you really need to do is stack defence and attack, but the Puzzle is where the game really shines.